Why?... I don't know my friends!! Trampling my pain, I cry in solitude. To bear the grotesque pain, alone. I receive no answers, not at all. And, my friends, my mind stiffened. My mouth sealed my voice, I know not why!! ©cyclopseven. All rights reserved 311008. The tips of the green grass. Blows the rhythmic notes into my both ears. The wind, I tried to cup. ©cyclopseven. All rights reserved 281008. Human intelligence cannot estimate what we owe to woman, sir. She sews our buttons; she mends our clothes; she ropes us in at the church fairs; she confides in us; she tells us whatever she can find out about the little private affairs of the neighbors; she gives us good advice, and plenty of it; she soothes our aching brows; she bears our children - ours as a general thing. From the book Because You're You..A very special guy. Deepavali, also known as Diwali in some parts of the world, is approaching. Come Monday 27/10/08, Hindus from all over the world will celebrate this festival of light. Deepa means light, while Avali means array or line. so Deepavali means array of lights. According to the Hindu belief, thousands of years ago, a demon called Narakasuran was causing tremendous havoc and fear on earth during his reign and no one could defeat him. So, it took an embodiment of divinity, Lord Krishna to wage a fight against the demon and defeated him. The day Narakasuran was killed is celebrated as day of light where darkness had been removed. This is one version of the story why Deepavali is celebrated. And in Malaysia, where there are considerable number of Hindus, Deepavali is celebrated grandly. The moral of the story is to kill the demoniac qualities in each one of us and set our path towards the light. The day is celebrated with early morning oil bath, family prayer at home, temple visits and feeding the poor. While, the wealthy ones distribute new clothing and money for poor families. ©cyclopseven. All rights reserved 261008. 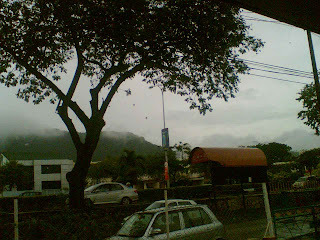 Rainy seasons in Malaysia can be grouped into two time frames. 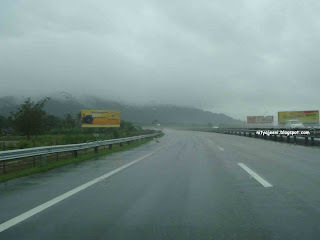 North-east monsoon blows from October to March and South-West monsoon between May to September. 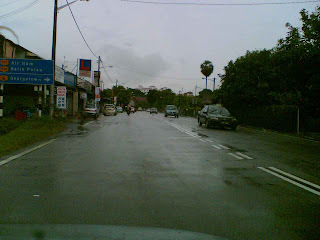 Now it is the North-east monsoon and it has been raining almost daily on many parts in Malaysia. 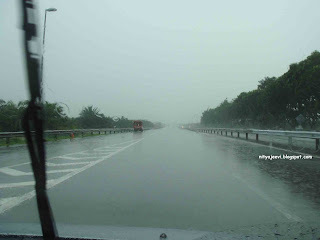 A drive along the highway during the rainy seasons is my favorite choice. 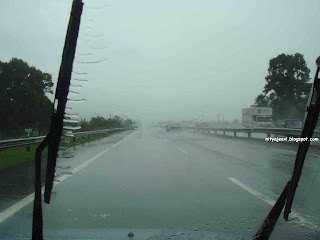 I love to drive slowly, enjoying the beauty of the rain as it hits my windscreen and gently wiped by the wipers. 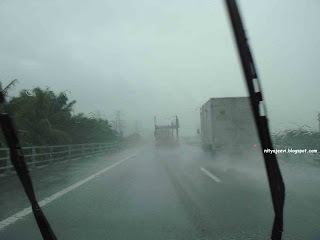 But, sometimes it can be pretty challenging when the wind is strong and the visibility rate becomes very low. The clatters I heard as it hit my car from all corners converts into melodious music. Its wild roaring at high speed tells man of the power it possesses, both to accentuate the survival and also towards the destruction of human race and nature. 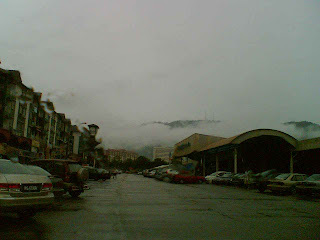 Bathing the entire plants and animals, filling the rivers and overflowing the dams, rain is a beauty in her own style. 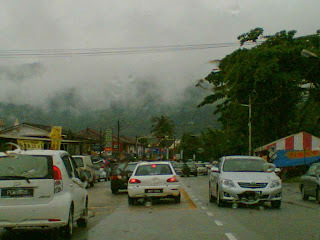 The torrential perpetual gush I see as her tears to mark human greed who shelved off the trees and hills. The sublime touch of rain lifts my soul high. 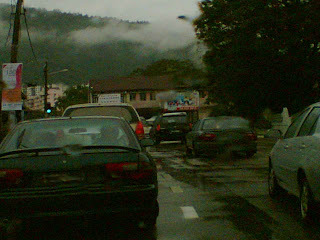 Yesterday afternoon it was raining heavily as I drove south bound along the North-South Highway from Penang to Taiping. 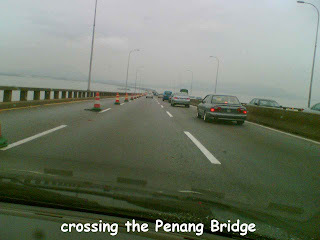 I enjoyed the drive very much and managed to snap some pictures while holding onto the steering. 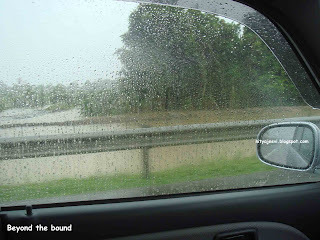 Some areas along the highway appeared to be flooded and I wonder how many poor families (especially the villagers who depend on crops) are affected. 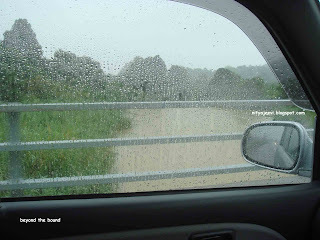 This is a typical problem faced by those staying in the lowland areas. ©cyclopseven. All rights reserved 251008.
this is not a land that belongs to us. and patience and serenity and respect. that shaped them and their world of wildness. that made them one of the great miracles. an urge to preserve what he cannot replace. ©cyclopseven. All rights reserved 241008. ©cyclopseven. All rights reserved 211008. ©cyclopseven. All rights reserved 201008. Crying for nothing but love and care. You and I breathe the same air like them. ©cyclopseven. All rights reserved 181008. What can I say if I hate you? What can I say if I love you? My venture takes me closer. If I hate you more. If I love you more. ©cyclopseven. All right reserved 181008. 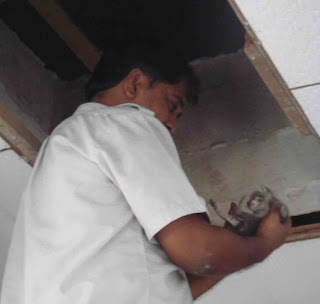 "There is a kitten trapped in the ceiling". My mum's words echoed loudly and clearly. I looked at her, and she continued, "We could hear kitten meowing almost daily". Apparently, they tried to get the neighbors help to bring the kitten out. But, things didn't really work the way they planned as the kitten went farther into the inaccessible corner of the roof. I was very sad knowing a life is at stake, and decided to get it out from the roof. I had no choice but to break one of the ceilings to get a glimpse of this kitten. In the beginning as I popped my head into the dark space, I heard nothing. Very quiet. "Ma, I don't see any kitten here. Perhaps, the mother cat has taken it away to a new hideout", I said to my mum. As I was about to step down from the ladder, suddenly I heard this meowing sound. Using the torch light, I saw two shining eyes staring at me through the small gap between the ceiling and the concrete beam. Yes, it is there. But, there was no proper way to get to it as the concrete beam laid across, blocked whatever little space in that corner. Somehow, using a long pole, I managed to push the kitten to quite an accessible corner where my hand can squeeze through to grasp the tiny little feet of the kitten. It didn't react. Guess the kitten was extremely exhausted after days without food. We gave him some milk which was fed using a syringe, but he refused to swallow. Then, decided to leave it in a box and placed it in the porch. 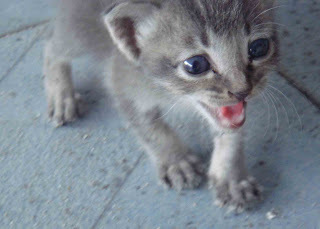 Felt so sorry for the kitten that I occasionally placed it between my hands and gently stroked it with my fingers. The eyes appeared to be glaring. But, it died after a few hours. I felt very bad and very sad. The mother cat came after he died. Don't know what to say. 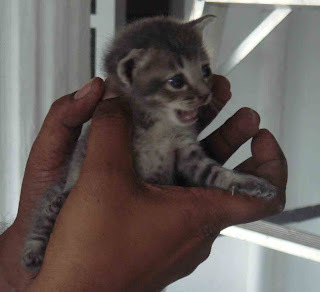 It is not just a kitten, but a life....which was wriggling in my hands earlier as I cupped it gently. What can we say? There is an end for everything. We just have to accept the reality. And, life goes on. Hope it will come around one day looking for me. ©cyclopseven. All rights reserved 121008. Can I shine like the sun? Daily, from the unwanted strain. My battle against time makes me lonely. ©cyclopseven. All rights reserved 081008. ©cyclopseven. 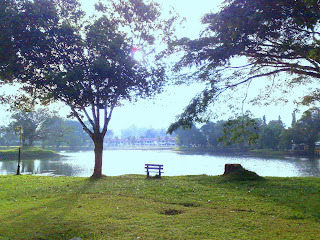 All rights reserved 071008.
to brighten up my life. and give me a reason to live on. but hidden beneath the mysteries of life. but not the soul I am. ©cyclopseven. All right reserved 061008.
superimpose on another man’s deliberate ignorance? legally justified by illegal means? one’s right to practice his culture? one’s right to impose his culture? one’s right to practice a tradition? one’s right to deny another tradition? one’s right to speak his language? one’s right to destroy that language? one’s right to fight for justice? one’s right to define justice waywardly? one’s right to practice a religion? one’s right to claim superiority of his religion? prompting the good over evil. discussing events of the worldly tales. lies darkened with soot hanging. an opportunity to unravel the bliss. teardrops contained in the bowl of frustration. a god locked from outside. and in hope I live the song I sing. and in sad tone the guitar he strings powerfully for a song. only the present, the solid manifestation. before the final hours arrive to say the last rites. without a feeling to laugh in happiness. for that death I wish, shall become His ultimate call. ©cyclopseven. All rights reserved 051008. ©cyclopseven. All rights reserved 041008. To be absorbed unto everlasting joy. When she entered her privacy, roses cried in sorrow. Knowing an angel is roaming there. For you are the precious among the roses. To swiftly push them away. And wipe each others tears. But, my heart that refuse all but you. Yet, I enjoy only your lovable nuisance. A voice I hear within, so fleetingly soothing. ©cyclopseven. All rights reserved 031008. A small corner in the universe….. 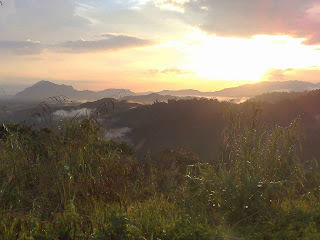 The hills that speak the wonders of Kroh. Ingrained in between the valleys are mysteries that speak the glory of mankind. 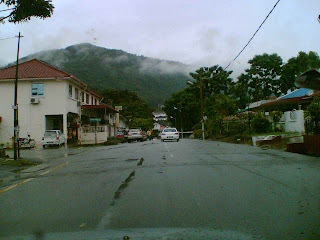 It has been more than 20 years since I left this small quaint hilly town, called Kroh, now known as Pengkalan Hulu. Life takes me to many places, yet my heart I have left in Kroh. I am very lucky to have spent half of my life in this town. I am planning to visit this town before the end of the year. Hopefully, more pictures of her will adorn this page. 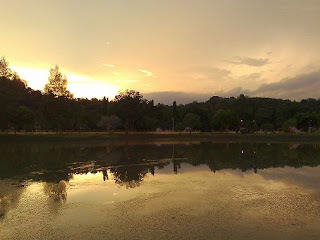 The lake in Kroh or now Pengkalan Hulu, carries the laughter, tears, trauma and agony of many souls throughout ages, and that including mine too. Not laughter, but only tears. 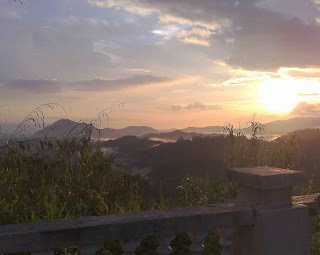 One day, as opened my eyes wide and stared at these pictures posted in another blog, a sense of deep attachment began to sweep across my being. Yes, this is where I belong. 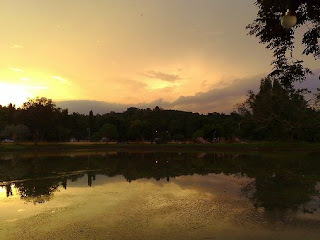 My existence today, in this very presence, I thank to not just many kind souls around me but also to this lake (check pictures), nature’s gift to the inhabitants of Kroh. Why? One may wonder in amusement. I was racing against time, fighting a war unseen by naked eyes. 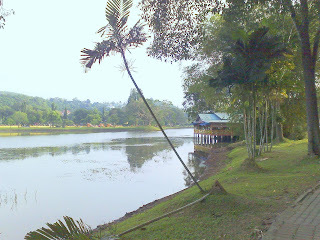 This lake or Taman Tasik or locally known as Takung helped to ease my burden in the past. In the moment of deep despair and loneliness, this is the only place I would frequent most. 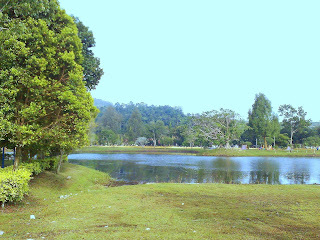 The serene beauty sways in tranquil atmosphere as insects, animals and humans contemplating on her majestic countenance. 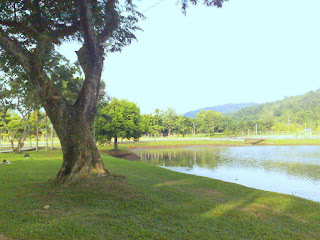 Sitting on the bench under the tree, I would be throwing pebbles into the lake. 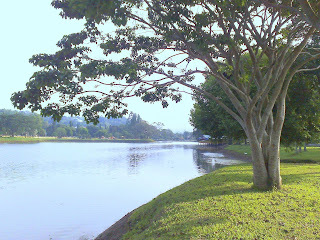 The ripples that formed gleefully contented to share my pain and tears. 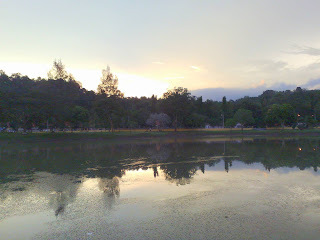 As they disappear unto the waters of the lake, the ripples slowly removed my pain as well. 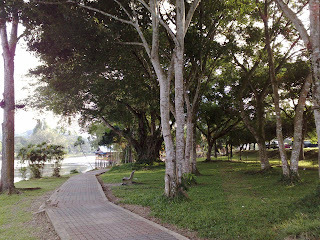 Though momentary, it was always a wonderful relieve for me. 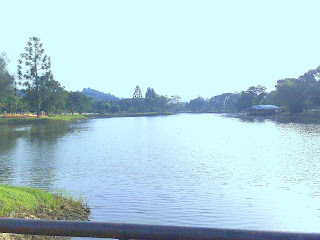 I can’t remember how many drops of tears (of mine) entered the lake and merge in it. But, she always cares for me. And, I know that very well. 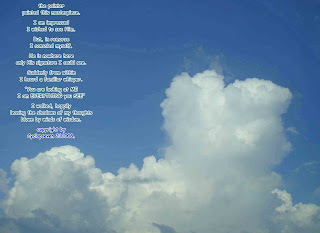 I would like to express my gratitude to Ms. Radha for her kind consent to use the beautiful pictures above from her wonderful blog http://kaleiselvi.blogspot.com. So you may walk on the lotus of my love. Holding your hand safely across the pain. You will gain a strong composure. And, two of us shall trample the unwanted, ever. So, let us walk the trail minus the blaze. a mere traveler in time. the sky too it devours. My happiness is sweeping across. Unto known love, I am basking, my dear. In clear reflection without the ripples. And every moment it is only you. I am grinning from the East to the West. That I still do care for you. To shout that you are the brightest.